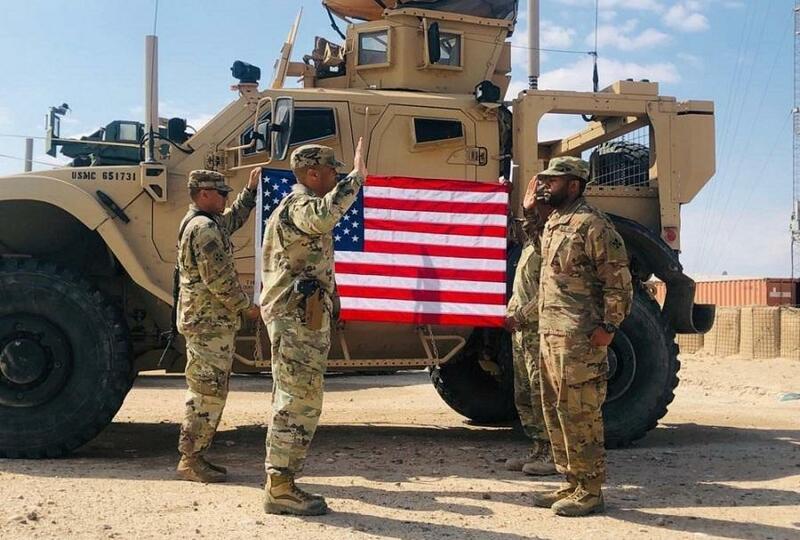 A U.S. Army soldier repeats after his company commander during a reenlistment ceremony at Al Taqaddum Air Base in Iraq on March 15, 2019. This week marked the 16th anniversary of the U.S.-led invasion of Iraq, where more than 4,500 American heroes have made the ultimate sacrifice with over 30,000 U.S. service members wounded during the war effort. If you walked through a mall and told shoppers that U.S. troops are still risking their lives in Iraq, most would probably be surprised. That’s one reason why I was deeply moved by the above photograph showing a brave soldier in Iraq raising his right hand to reenlist in the U.S. Army. We are so grateful to this warrior and his family for stepping forward to defend the defenseless. The Pentagon’s latest strike report data shows just how busy U.S. and coalition forces have been in Iraq and neighboring Syria. Between February 24 and March 9, “99 strikes consisting of 139 engagements against” ISIS were recorded in the two countries. “Troops here are now bringing down the black flags of ISIS,” according to Fox News foreign correspondent Benjamin Hall. If Trump administration and defense officials eventually confirm Fox’s reporting, it will mark a historic military achievement that was virtually unimaginable four-plus years ago. The deployed soldier raising his right hand to once again volunteer is a vivid illustration of why paying attention to our military community’s daily deeds is so important. Sixteen years after the war in Iraq began, we honor the fallen, the wounded, their families, our veterans and the thousands of men and women still raising their right hands to preserve our freedom in the Middle East and beyond. I remember dozens of pundits branding Afghanistan as “the forgotten war” around this time 16 years ago. Ironically, the absence of consistent Afghanistan coverage highlights the fact that it was many journalists who ultimately forgot about America’s longest war. While politicians are just as much to blame for Afghanistan largely disappearing from the national discussion, two senators of different political persuasions helped spotlight the war this week. As peace talks continue, Republican Sen. Roy Blunt recently visited Missouri troops serving in Afghanistan. Democratic Maryland state senator William C. Smith Jr. will get an even closer look at the sacrifices of the approximately 14,000 U.S. troops still serving in Afghanistan. That’s because he’s about to be among them. Smith will soon deploy to Afghanistan for eight months with the U.S. Navy Reserve, according to The Washington Post. It will be his first experience in a combat zone. We thank state Sen. Smith and wish his family all the best over the next eight months, which will hopefully culminate with his safe return. Update: After this story was published, NATO announced that two U.S. service members were killed in Afghanistan on March 22. As of Friday morning, no other information had been released. Please pray for the families of these two American heroes. My favorite part of the work week is searching through recent photos of American service members coming home from overseas deployments. The one I stumbled on this week, which shows a sailor meeting his baby girl for the first time, certainly didn’t disappoint. 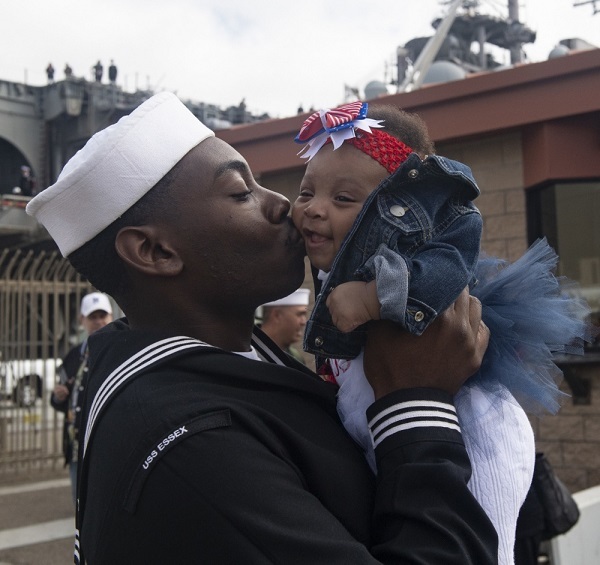 A U.S. Navy sailor meets his daughter for the first time at Naval Base Coronado upon the return of the USS Essex to San Diego following an eight-month deployment on March 1, 2019. Congratulations on the new addition to your family and welcome home, hero!